Race Point Publishing, 9781631063343, 128pp. Connect with your child as you make art side by side in this playfully illustrated journal, with 50 full-color spreads to color, fill in, and draw and creative prompts from licensed art therapist Lacy Mucklow. “How was your day, sweetie?” “Fine,” the child replies. 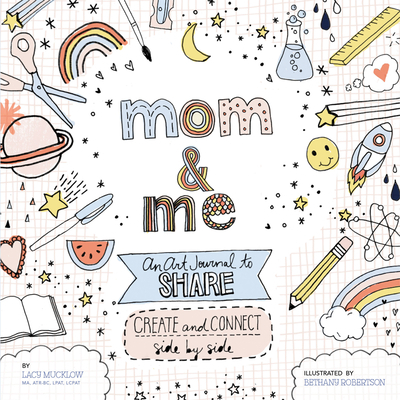 Mom and Me: An Art Journal to Share is a place where you and your child can open up to each other and explore feelings through fun, creative activities. Each spread has one page for each of you to fill out. As you spend this quality time with your child, you’ll also create a keepsake that you will cherish for many years to come. Mucklow offers up the best ways to communicate with your child through creating together, how to start an open conversation with your child, and questions you can ask that will help generate thoughtful responses. Among the many things you’ll explore: what makes you angry and happy, what you would look like at your dream job, the album cover of your life if you recorded it now, something you miss inside a memory jar, and what you would find behind a castle door opened with a magic key. Enjoy this creative time with your child in the moment while you record it forever in this beautiful book. Bethany Robertson is an illustrator and designer based in Brooklyn, New York. She has a Master’s of Fine Arts from Rutgers University and a Master’s of Science in Art Education from the University of Tennessee, Knoxville. Bethany enjoys drawing, pizza, flowers, ice cream, and the beach. You can find more of Bethany’s art on Instagram @loveless_designs.